They enable easy, fast and efficient cuffing. It is not possible for the cuffed person to release the cuffs by the strenght of muscles or simple objects one can find around. The construction consists of steel shackles with backstop clamp mechanizm and swinging single strand. Blocking mechanizm is in both cases, which allows to block the ratchet in every position not pressing the cuffed person too much and additionaly locking the cuffs – double lock tip on the key locks the cuffs and turnig the key in the keypost releases the cuffs. Its construction, when used properly, does not cause abrasion or injury. Handcuffs are made of stainless steel that is not toxic to human organism, there are no galvanic layers on the strands. Handcuffs are resistant to static tearing force measuring up to 2300N (force applied to the one clamp, the other clamp fixed). After the test handcuffs remain usable. 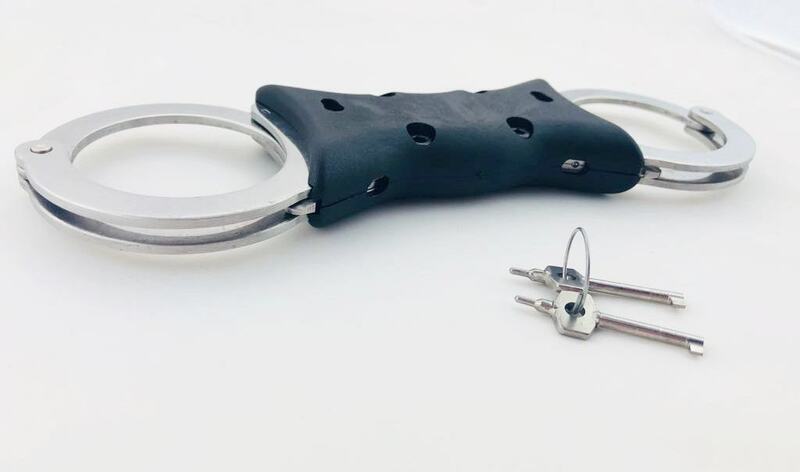 Handcuffs are resistant to static bending force measuring 500N (clamp fixed on the swivel side, force applied vertically to the surface of the clamp on the other extremity). The force is not causing permanent deformation. In 2011 the Military Centre for Standarization, Quality and Codification provided us with NATO Comercial and Goverment Entity Code NCAGE: 2034H.